A DIGITAL DOWNLOAD FOR ONLY FIVE BUCKS! Have you ever wanted to put on a stand up magic show but just couldn't seem to get your act together? Then this is the video for you! 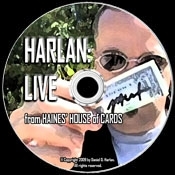 HARLAN: LIVE from Haines' House of Cards (shot on location in beautiful Norwood, OH) features a Full Professional Stand-Up Show by Dan Harlan & How to Do It! First, you'll be treated to a show featuring Harlan's favorite Magical Creations. They're all here: Two Left Hands, Hold It Buster!, Crazy-8, The World's Saddest Trick, Ritual Necklace, My Word, Tightrope, Cheez Wiz, and Starcle. This is the Cream-of-the-Crop, "Go-To," A-Plus Material from one of magic's most respected Performers. Then, Harlan teaches everything. All the bits fully-scripted, performed and explained in detail. The hard work and planning conveniently done for you! All you have to do is follow along and before you know it you'll be ready for the stage! Plus, you'll also receive an Interview with Harlan and a few Bonus files for some of the effects in Harlan:LIVE. All this incredible information for only five bucks! When you order, a link will be sent to you (typically within 24 hours) so you can download and enjoy at your convenience.